As fun to eat as they are to say, these little puff pastry squares couldn’t be less complicated. And if you can resist eating them all before you leave the house, they’re going to make you so many friends. Bosc pears have a bright honey-sweetness that cozies up with the fruity notes of Reny Picot Camembert and their firm flesh won’t turn to mush in the oven. Line two baking trays with parchment and preheat oven to 425°F. Cut eight 5 1/2-inch squares from puff pastry and place on prepared trays. Arrange sliced pears on pastry squares, leaving a 1/2-inch border. Drizzle with honey. Brush pastry edges with egg. Remove from oven and arrange Camembert slices on top of pear layer. 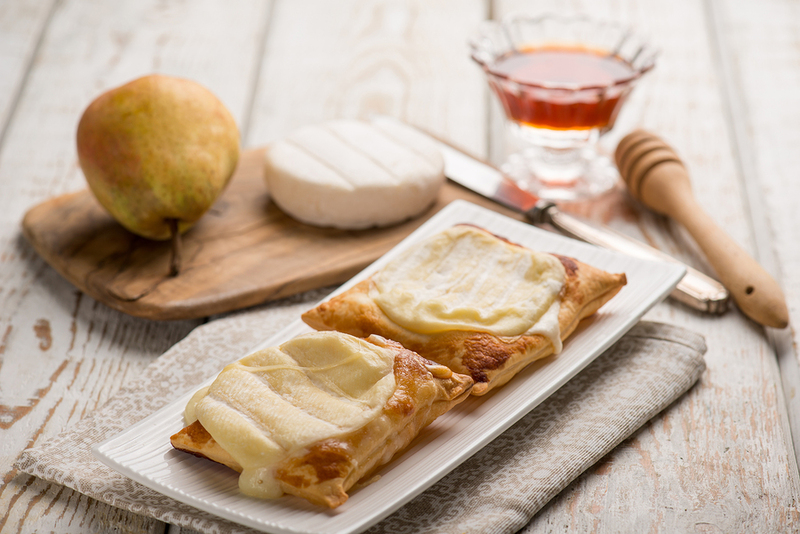 Bake for 10 to 14 minutes or until cheese has melted and pastry is golden. Sprinkle with fresh thyme leaves and serve warm.